On my way to work last week, I stopped at the grocery to pick up last-minute essentials, like diet soda (cringe, I know) and a snacky food. Instead of pastries to share, I brought a bag of apples, which I knew I’d fruitlessly offer to others. For some reason, people are reluctant to take apples from a woman named Eve. I also picked up a bag of macadamia nuts, which I measure out before I eat. They are delicious, but they’re also a bit fatty and calorie-dense. You have to be careful with your fat when you don’t have a gallbladder to help you digest it. So I weigh out an ounce with the little scale I picked up at Target. 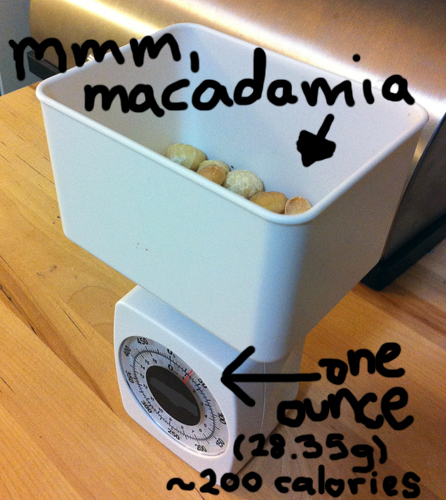 One ounce of macadamia nuts, about 200 calories. And never feed these to your dogs. Ever. Even though I have a good lunch, sometimes my breakfast is a little less reliable. I may opt to buy eggs or a protein bar at the grocery or a gas station on the way to work. Sometimes, I have tuna. Sometimes, I am slightly grossed out when eating tuna straight from the can over the trash can in the work kitchen, and I discover a few errant fish scales in the can. Or in my mouth. And so, having a variety of options as safeguards in place to give myself healthy alternatives is a method I’ve adopted to help keep myself on the straight and narrow. 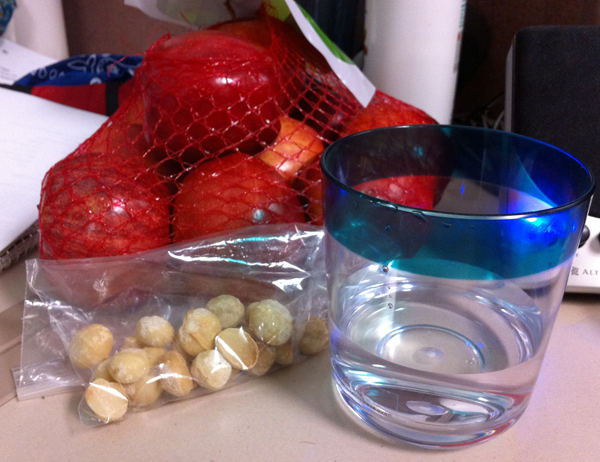 The stewards of my workday snackiness – hearty snacks, something a little sweet, and something to ensure I’m not just thirsty. I haven’t counted calories much for the past several months, but overeating isn’t a problem as long as I have measured portions of more calorie-dense foods. And it’s hard to overeat on raw fruit. The water helps me test whether I’m actually hungry. It also cuts down on the amount of diet soda I drink. I’ll be in trouble when they start caffeinating the water cooler water. Refrigerated coconut milk. I didn’t think I could drink a whole carton by myself before it went bad. Plus, there’s added sugar, which ain’t in my diet. 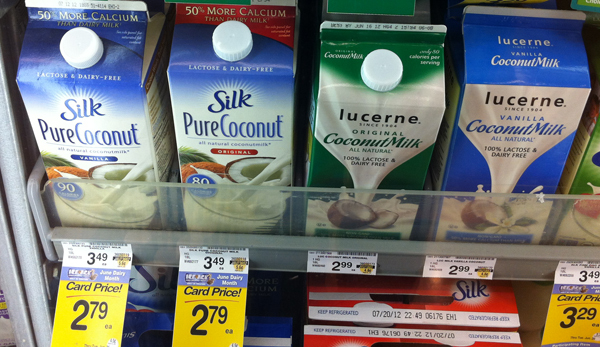 Oh, hi, coconut milk in the dairy section. Checking out the nutritional information, I wasn’t thrilled with the sugar content (I remember drinking chocolate soy milk like cold water in hot summer, probably also due to the sugar content), but it was nice to know there were options. “Well, I wonder where the canned coconut milk is. Probably too much of a pain to try to track down.” I turned around to check out the clearance shelves right behind me, saw these, and knew I should probably take the hint. 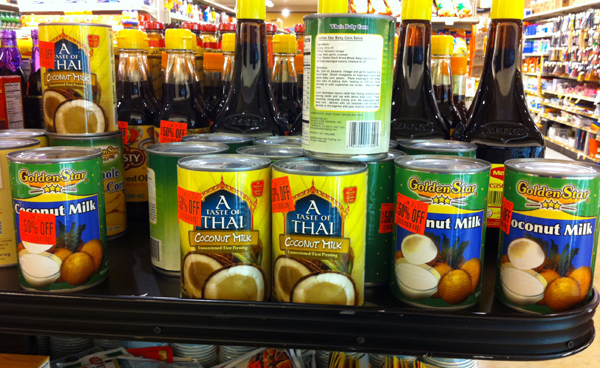 This coconut milk in a can has fewer additives, no added sugar, and is on sale. I transferred it to a mason jar when I got home. Ok, FINE, universe, I’ll take home your stupid coconut milk. I tried it out in a cup of coffee with a little half and half, a little Splenda. I was not really impressed. But I’ve been used to drinking super artificially sweet coffee for so long, it will take me a while to get acclimated. I had black coffee with a little Splenda in it the other evening. Amazing how little coffee you can manage to drink when it doesn’t taste like a kind of liquid candy. It’s an ongoing experimentation, trying to find a combo that works for me. But I’m glad I went for it and explored my options there. Finally, I didn’t bring my lunch last Friday and ventured all the way across the street from my office to get fast food for myself and a friend. I knew the restaurant had salads, but I’d always bought the greasy pizzas or greasy sandwiches. This time, I got a salad, and man, it was fantastic. I never knew. A fantastic salad that’s mostly on my diet. 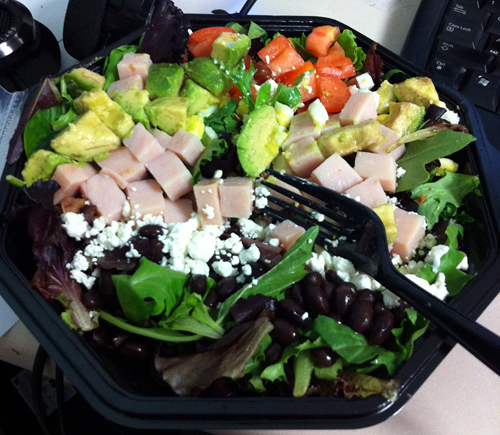 Lettuce, spinach, avocado, tomato, feta cheese, ham, turkey, bacon, and black beans. My meal was, altogether, about $8 with a drink. Amazing how a restaurant you’ve visited for years and dismissed for many years longer can still surprise you with gems like these. It can be tricky to eat in a way that best suits your healthier diet, but if you look hard enough, take time to consider your needs, do some research, and trust to blind luck from time to time, you can be versatile, make most any situation work for you, and enjoy your lifestyle rather than endure your diet. This entry was posted in food, health, weight loss and tagged fast food, food, habit, low carb, monday meals, paleo, Photos, vegetarian. Bookmark the permalink.